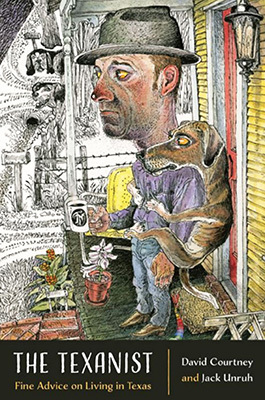 I reviewed The Texanist: Fine Advice on Living in Texas (University of Texas Press) by David Courtney, illustrations by the late Jack Unruh, for Lone Star Literary Life. This little book is great fun, full of playfully illustrated bons mots, fun facts, digressions, “grammatical murder,” and a regrettable pun or two. It would make a lovely Father’s Day or welcome-to-Texas gift. WWTTD—What would the Texanist do? The brief essays collected in The Texanist: Fine Advice on Living in Texas were written by David Courtney beginning in 2007 when “The Texanist” debuted as a column in Texas Monthly. The late Jack Unruh produced inspired, whimsical illustrations for each column until his death in 2016. Employing humor sometimes subtle, sometimes laugh-out-loud, Courtney’s advice column attempts to answer questions submitted from those unsure of proper Texas etiquette. Q. Isn’t it rude for farmers driving tractors to hog the road and delay traffic? Q. Is it legal to eat roadkill? Q. Is it against the law to pick bluebonnets? Unruh’s illustrations are pure genius in both their fine detail and general ambience. Courtney is portrayed as a swarthy fellow, often with bloodshot eyes and in need of a shave, who appears to be cheerfully hung over, whether in a tux, a toga, or an evening gown. The Texanist is always accompanied by Li’l Bubba, a curious creature who resembles a miniature Aztec bird of prey with the nose of Cyrano de Bergerac, wearing a jester’s hat and leopard-print leggings. In short, The Texanist is great fun, full of playfully illustrated bons mots, fun facts, digressions, “grammatical murder,” and a regrettable pun or two. It would make a lovely Father’s Day or welcome-to-Texas gift.